I think this might be the first article here that's specific to an engine other than the 2.4L LD9. Thanks to David for providing the write-up so the 2200 owners can have something specific to them. Note that the concept here is the same for any engine so if you can find your battery and your alternator, then you can do this mod no matter which j-body engine you have. Sometime in the future, I'll be doing a similar write-up for the 2.4L but since it's been something I've been planning for ages now and hasn't happened yet, there's really no telling when I might get around to it. Here is how to do the big 3 on the 2200. Less strain on your vehicle's charging system. Heat shrink tubing of proper size. 14mm, 13mm, 12mm, 10mm, 9mm sockets. 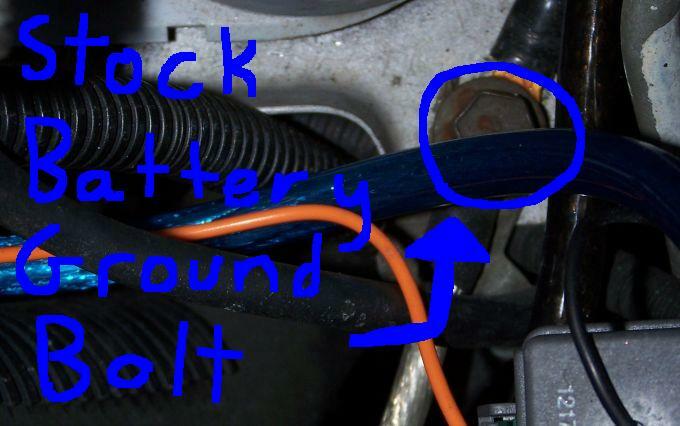 YOU MUST DISCONNECT BOTH POSITVE AND NEGITIVE BATTERY POSTS BEFORE YOU EVEN THINK ABOUT TOUCHING THE ALTERNATOR, YOUR LIFE MAY DEPEND ON IT. First thing first, Disconnect the battery, both positive [+] and Negitive [-] terminals. If you have a battery with both top and side terminals, like i do, disconnect them all. Your life may depend on it, and i can not stress that enough. You can use a 9mm socket on this, or pliers if need be, but always disconnect the ground FIRST. 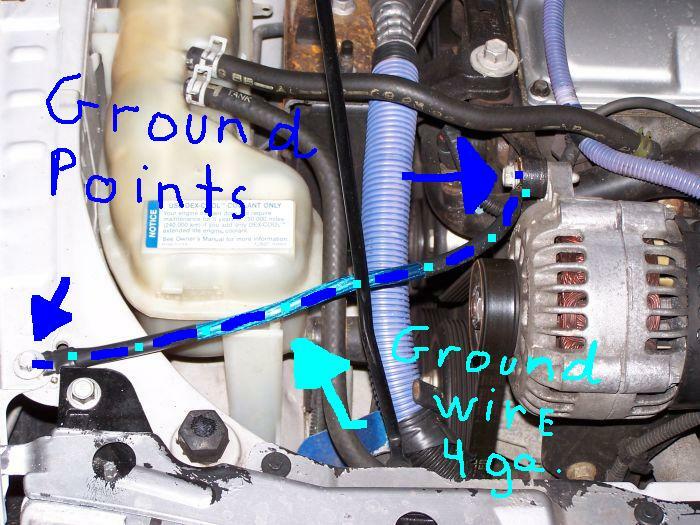 Disconnect the Alternator [ALT] power wire, by sliding back the rubber boot, and using a 14mm socket to loosen it. The bolt itself will move a littler bit, then stop, and then the nut on top will lossen, and come off. see figure 1. Take the wire of your choice, whether it be 0/1 gauge or my choice, 4 gauge, and figure out how you want to run your wire from the alt to a fuse, then to the poitive side of the battery. There are several ways to route the wire. I choose to mount my ANL fuse holder against the top radiator support, and then route the rest of the wire across and to the [+] battery terminal. See figure 2. After you figure out how your gonna route your new wire, Cut the wire about 1" shorter, you take in account for the length of your ring terminals. Use a knife or razor and cut the insulation off the end of your wire about .5 cm. I fibd the easiest way to do this is to take a knife and roll the wire back and forth while the knife cuts through the insulation, down to the center wire. Do this on both sides of the wires ends. And remove that section of insulation. Slide on a 2" long piece of heatshrink onto each side of the wire BUT DO NOT heat it up yet. Insert the ring terminal onto the end of the wire, and whack it tight with a hammer. I find its the easiest way to do it. You can use the screwdriver like a chisel of sorts to make sure the ring terminal is on damn tight. If it comes off with a light pull, keep trying. You dont want it falling off. Now slide the heat shrink over the recently flattened end of the terminal as far as it goes. It may take a little practice, to get it to go over that part of the terminal. I find that working your fingures like milking a cow seems to work. For some reason, if your wire spits a white fluid, RUN, its possesed. After you get that heat shrink over the the flattened ends, use your heat gun or hair dryer to heat up and shrink the endes to a nice protective covering. I used a heat gun cause it only takes about 2 secs to shrink the heat shrink. It will take longer with a hair dryer, but thats ok.
Now repeat steps 4,5,6,7,8,9 with your other wire on the other side of where your fuse block is going to be. 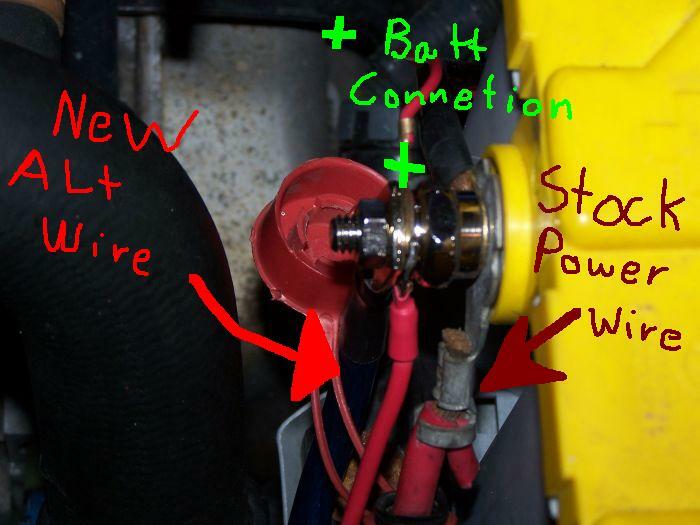 Now connect your new power wire to the alt bolt WITH the stock wire too, and tighten the nut. For your safety, try to cover the two Alt wires with the rubber boot that was there, most likely it will only cover one of the two wires, but atleast its better then nothing. 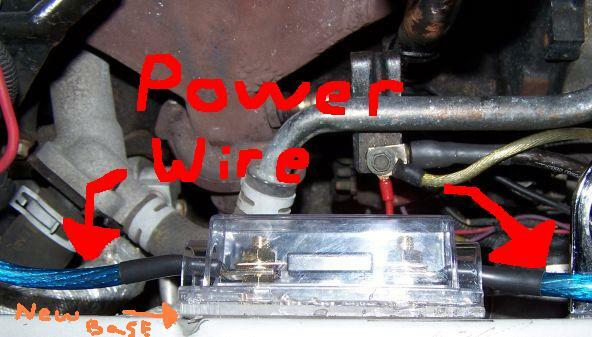 connect your New alt wire to one side of your fuse holder, with fuse in place, and now connect your other side of your fuse block to the other power wire which goes to your [+] battery post. BUT DO NOT CONNECT TO THE BATTERY POST JUST YET. see figure 3 and 4. Now for the Alt ground wire, This is one of the easiest parts to do. 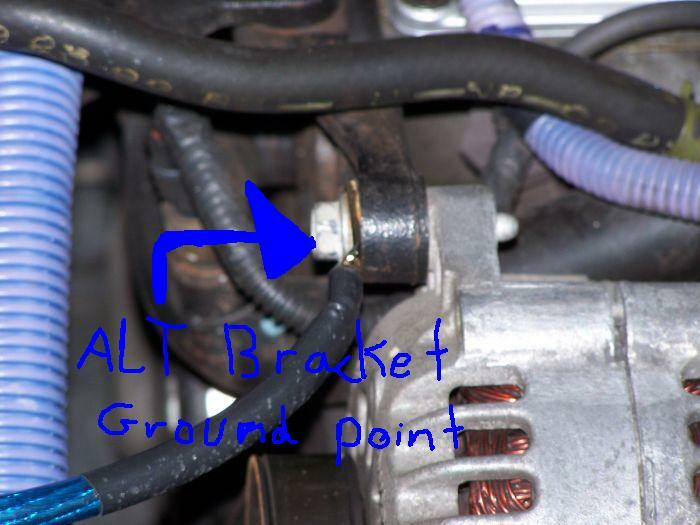 Use your wire as a measurement from a ground point of your choice to an Alt mounting bolt. See figure 5, 6, and 7. 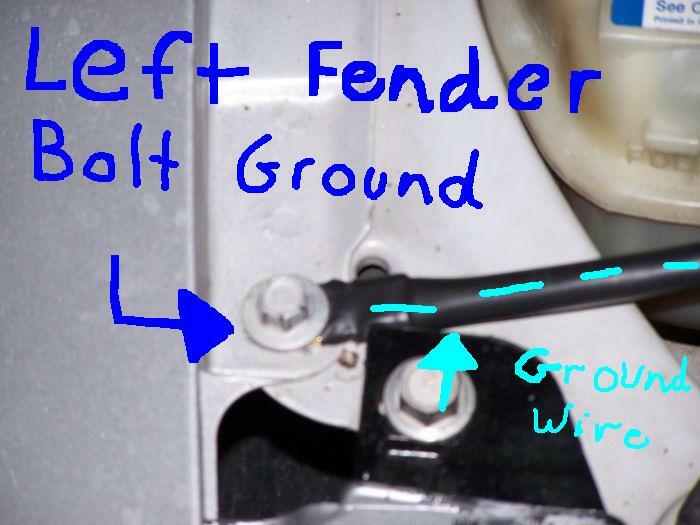 Repeat steps 4,5,6,7,8,9 for your ground wire from a chassis ground point to an Alt ground bolt. Simple see? BTW, the ALT bolt i used was 14mm, and the fender bolt is 10mm. 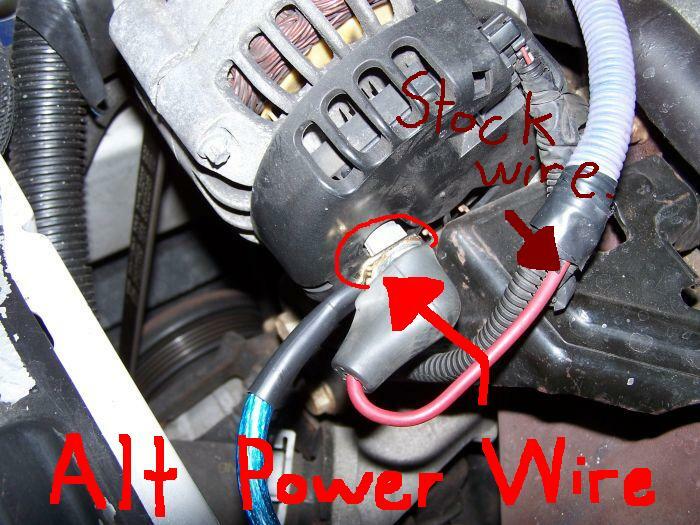 NOTE- in the last 3 pics, the Alternator ground wire looks like its either touching the pulley are really really close to it. It's not. It's actually 2.5 or 3 inches away from the pulley. OK, we are almost done. 1 last wire to go, and thats the battery ground. And its very easy to do. Last wire to measure up and its a short one. You can either make your [-] battery terminal go to either the stock ground, or somewhere else. The stock ground point is just as good as just about anywhere else, and its the battery tray itself. I didnt use it cause i already have improved grounding to the battery, from my ultragrounding. See figure 8. Just follow steps 4,5,6,7,8,9 again for your last wire. NOW YOUR DONE, well kinda. Make sure your new Alt Ground is hooked up and all the bolts are tight. Next hook up your new [+] alt Wire with your stock wires to the [+] battery terminal. 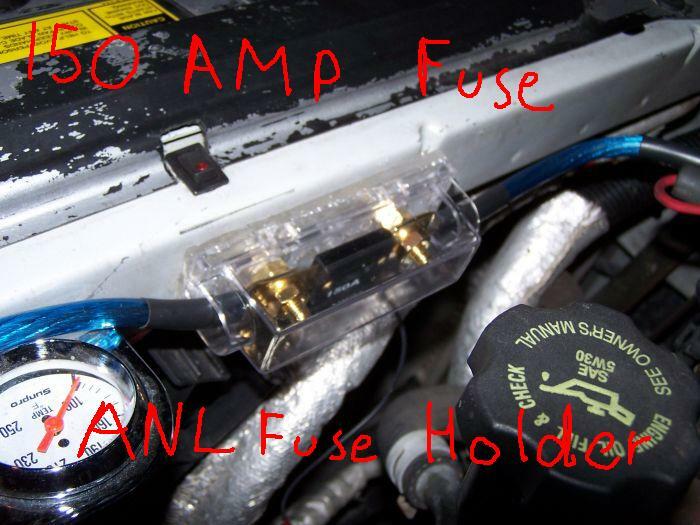 Make sure your ANL fuse is in place too. And the last thing to do is hook up your new ground wire for the battery with your stock battery ground. YOUR DONE, now get some coffee, and happy bass bumping.